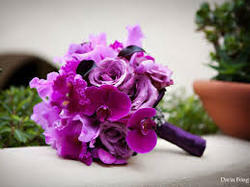 Orchids are one of the highly loved flowers that represent luxury, beauty and strength. 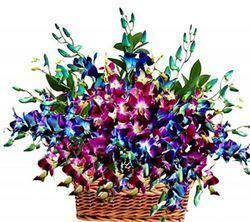 One side hand bunch of 6 Purple Orchids & 6 White Orchids in two layer paper packing in Blue & white color paper packing. Orchids are the most highly coveted of ornamental plants, the delicate, exotic and graceful orchid represents love, luxury, beauty and strength. A beautiful arrangement of 10 white glads, 10 Asiatic yellow Lilly, 10 blue orchid. We are offering a qualitative range of Dendrobium Burana Jade which are outstanding in looks and are offered at economical prices. Taken directly from the growers, we assure of their freshness and fragrance which remain intact till they are finally delivered. Our beautiful bride chose a bit of tradition with this elegant orchid and rose cascading bouquet.